Orange Teriyaki Chicken - Slow style. So I'm watching the final episode of Alton Brown's Feasting on Asphalt, the one where his bike and shoulder meet a gravely end. The best discovery of the show, besides the Hawthorne police officer with the cast iron stomach, is the truck driver's 12 volt slow cooker. Alton had never seen one before, and neither had I.
I have to have one. But I can't find the item for sale anywhere on the Internet. 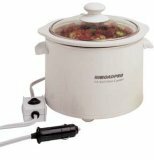 The closes thing I can find is this 12V 1.5QT Capacity Slow Cooker - Price: under $40 at Amazon.com. Not a bad deal, but I'm not sure I'd want to cook in it while driving, which is the charm of the box Alton Brown found. Still it does provide some interesting options for picnicing, car and RV camping, and the like. Anybody ever try using one before?